I’ve decided that with the hypersexualized Halloween costumes, I needed to make my own. I was a contest winning corpse bride in 2009 with Mom’s wedding dress (I was originally Tinker Bell, but Disney was deemed uncool and I was strongly advised against it–with teacher trouble. And besides, Mom said I could use it when I was younger). In 2013, I was Ingrid Michaelson–I had a dress like hers, the right glasses and a ukulele. This year, I am going to be Emma Wiggle, the first female member of The Wiggles. Of course, I hit the craft store and the glue gun for that one. I even made the bow! And don’t worry–I’m pretty odd, too. I think it shows in the derivative works I make! LOVE this pirate poppet! I was a kid in the ’80s, so I have distinct memories of plastic masks & plastic costumes (with room for snowsuits. It was northern Vermont and chilly!!) I love the idea of home-made costumes. I tell my boys every year that they can be whatever they want and I will make it happen! This year we have a dark knight & Super Mario. With 7 kids, I didn’t do all homemade costumes, but the ones that were are definitely the most fun to remember! Clowns, gypsies, fairies, robots, cheerleaders, football players, etc., etc., etc.! Fun! lovely! pirates do make great homemades ~ so do cowboys/cowgirls (i’m from texas, so yeah, lot of that in my childhood). My son wanted to be carrot cake this year. I had no idea how to make that happen, unfortunately, so he settled for Spiderman. My son has been a milk carton and a cup of milk. Those were a challenge to make. 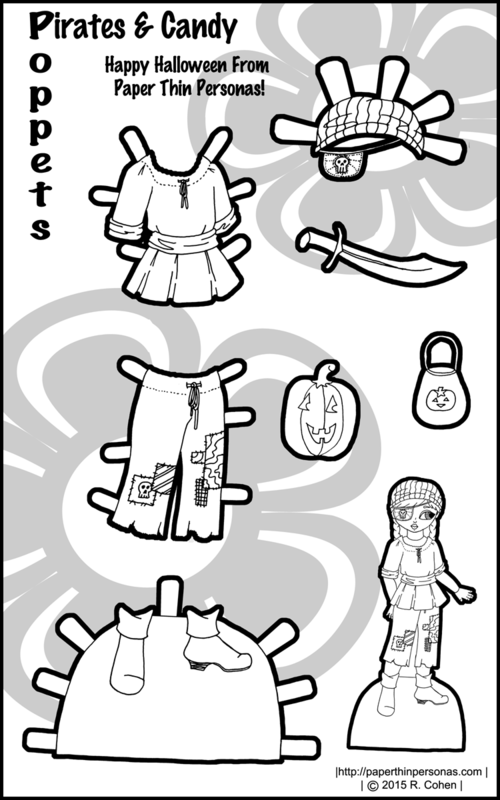 Where can we see the paper doll for which we drew dresses? And I sent you some more Poppet costumes. Post them, please? 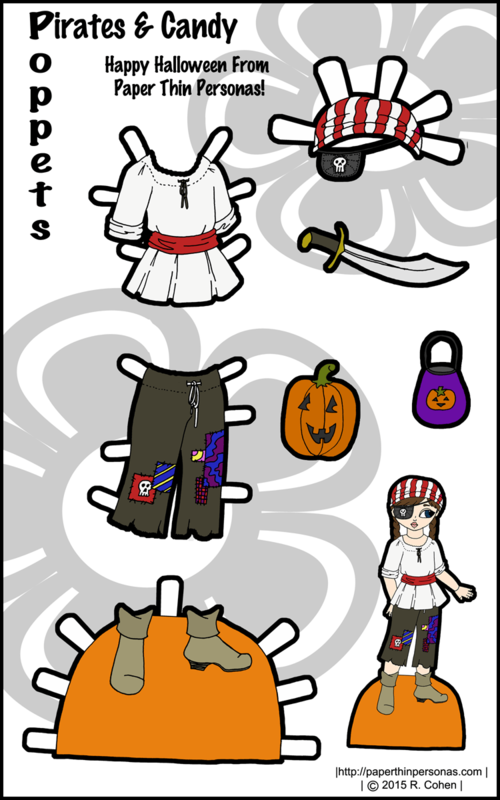 For the rest of the outfits you’ll need to visit Paper Doll School and Pop Culture Paper Dolls. There’s links in that post. This will work beautifully for Pieris, too. It’s been a while since I colored a paper doll or outfit, I think this will be a good one to start back up with.